Rhone Alphes, Cluses, France - Jul 29, 2015 - Following the successful launch of their new mobile applications at the recently held Paris Air Show, ADSoftware is delighted to announce the signing of Skyward Express Limited (Kenya) and Asia Atlantic Airways (Thailand) for their AirPack maintenance software. The 2015 Le Bourget Air Show was dominated yet again by some ground-breaking innovative launches. ADSoftware, took to the occasion and launched its latest MRO* mobile multiplatform applications for line and base maintenance. "The Discover, Learn, Experience, Exchange themed demo definitely attracted the attention of the visitors" said Sebastien Dunoyer, ADSoftware's Development Manager. "We constantly innovate and that's what makes the difference with the competition". ADSoftware has gone on to sign two more carriers after the Paris show, namely Asia Atlantic Airways and Skyward Express. The Bangkok-based carrier operates two Boeing 767-300ER jets, while Skyward operates a fleet of 3 Fokker 50s, 1 Fokker 100 and 2 Dash 8-300s. The ADSoftware stand quickly became a hive of activity and proved to be very popular among tech savvy aircraft engineers who could witness live how to interface line and base maintenance activities from a mobile device with the Maintenance Information System (MIS). Visitors at the stand could work on an iPad and share with colleagues on a TV screen what the system would generate. The "Dent and Buckle" feature available on the new AD APP left a lasting impression on the public. By simply taking a picture of the identified defect, the captured data is automatically synchronized on cloud with the AirPack system, to search for the right part number, raise the defect and automatically create a provisioning request. Featured innovations also included ADSearch and ADWatcher, two mobile apps dedicated to searching and classifying documents and ADRescue, a sophisticated database and applications secured backup solution. Speaking after their fourth consecutive appearance at the show, CEO of ADSoftware, Fred Ulrich said, "ADSoftware does not just make a sale, we build relationships. This first client feedback will be used to refine and improve our apps. Not only do we develop a platform that is perfectly streamlined into the customer's operations with the necessary bells and whistles, but we also build great relationships in the process." 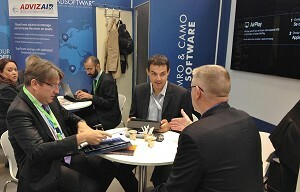 ADSoftware teamed up once again with Regio Lease, its CAMO specialised partner, and exhibited at the same stand. They introduced ADvizair, a new generation tool for maintenance reserves calculation used both at the beginning and the end of an aircraft or engine lease. The idea behind this partnership is to offer customers a comprehensive solution that simplifies maintenance reserve calculations for leasing purposes. ADSoftware is a seventeen year old IT company based in France, with offices in Thailand, Brazil and South Africa. Specialising in solutions dedicated to the aviation industry, ADSoftware counts 56 clients worldwide. The strength of ADSoftware is the accessibility of its products which are Microsoft Windows(r) ready, web-enabled, and multilingual. The company provides 24/7 online technical support. ADSoftware has also developed DailyPack a package of two integrated modules, DailyReport and DailyQual, used by military, police and rescue flying operations. It is a solution dedicated to recording and managing all kinds of missions, and to follow-up on skills and qualifications of pilots and aircraft mechanics. The MRO software company recently introduced 4 new innovative mobile multiplatform apps to its flagship AirPack suite. Skyward International was established in 2010 by a group of Kenyan based pilots and investors. Presently known as Skyward Express, the company offers regional cargo and passenger services from Nairobi on a charter and lease basis using a fleet of regional turboprop aircraft. Based at Nairobi's Wilson Airport the airline's current fleet comprises 3 Fokker 50s, 1 Fokker 100 and 2 Dash 8s. Skyward has grown in leaps and bounds to become one of the leading aircraft charter companies in the East African region. Skyward's clients include the governments of Kenya and South Sudan as well as a number of international NGO's including Medecins Sans Frontieres (MSF). Established in 2013, Asia Atlantic Airlines (AAA) is a Bangkok based passenger airline backed by Japanese travel giant H.I.S. and prominent Thai hotelier Baiyoke Group. The airline serves passengers travelling between Thailand and Japan, Thailand and South Korea, through Bangkok Suvarnabhumi, Tokyo Narita, Osaka Kansai and Incheon International airports. AAA currently operates their fleet of Boeing 767 aircraft from its main hub at Bangkok Suvarnabhumi International (BKK). The airline's strategy is based on becoming the aviation partner of choice for leading tour operators and travel agents in and around the region. Visit http://www.asiaatlanticairlines.com/ for more information.